CONVICTED FELON ARRESTED FOR POSSESSION OF METH AND FIREARM :: RickeyStokesNews.com! WASHINGTON COUNTY: A Chipley man is behind bars in Washington County after a traffic stop leads to the discovery of methamphetamine. 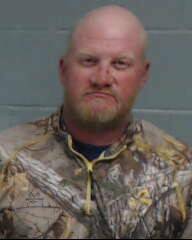 At approximately 8 a.m. Monday morning, a Washington County Sheriff’s deputy conducted a traffic stop on Clayton Road in Chipley after observing a Ford Mustang, driven by 35-year-old Benjamin Davis, speeding. During a search of the vehicle, deputies located a plastic bag of methamphetamine and two glass pipes in the center console. A rifle and ammunition was also located in the vehicle. Davis was arrested and booked into the Washington County Jail on the charges of possession of methamphetamine, possession of firearm/ammunition by a convicted felon, and possession of drug paraphernalia.